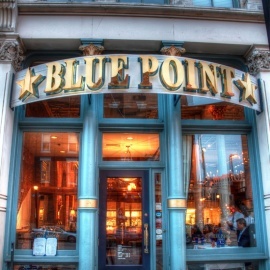 Blue Point Grille is a newer entry on the restaurant scene, but it already has a loyal following. Awash in blue, the elegant interior provides a not-so-subtle reminder of the restaurant's name. The kitchen finds the freshest fish, shellfish and lobster and prepares them in innovative ways, including mussels in tomatoes and garlic and notoriously sinful lobster-mashed potatoes.